What can Mobile do for the Marketer? We have already used mobile to message; financial transactions are already conducted on mobile devices; travel & retail on mobile are convenient as well. Google & Apple are changing the game dramatically. The little phone is powerful, has lots of information, & makes the consumer mobile. Join Mickey Alam Khan, Editor in Chief Mobile Marketer & Barg Upender, President of Mobomo in a discussion around what to expect and how to prepare for effective mobile enablement. 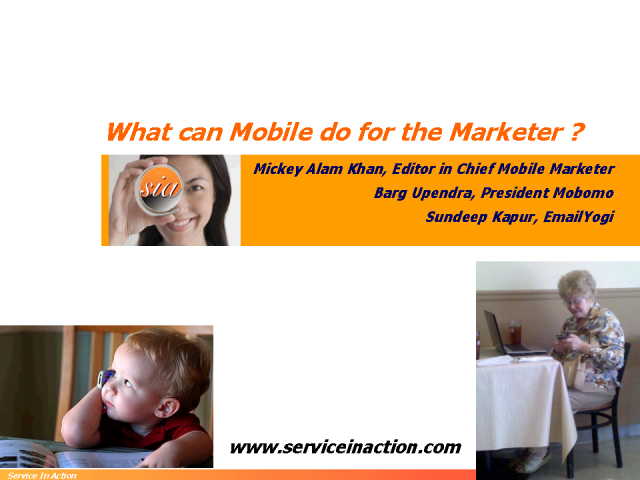 Title: What can Mobile do for the Marketer?